STP Chief Officer Phil Prentice shares his thoughts on a variety of opportunities and issues for towns. Phil Prentice: Could a “Caring Town” Housing Concept Transform our Age? The recent failures of retail giants Maplin and Toys R Us both had an air of inevitability but the news certainly didn’t have the same shock effect of the earlier casualties such as Woolworths, Comet and Blockbuster. Things are changing but ,put simply, this is all about the growth of online; clicks as opposed to bricks. However, it is worth noting that, even in the digital age, almost 80 per cent of retail spend still happens on the high street. We, as consumers, have clearly marked out our intent to shop, bank and live online and as a direct consequence our high streets, shopping centres and town centres are all facing radical change, but there is always opportunity. Across many Scottish towns, the shopping centre is the most dominant feature and the core of activity – towns such as Paisley, Greenock, Motherwell, Stirling, Dunfermline and Dundee, where the economic and social value to these places is often understated. We cannot allow these centres to fail but there are layers of complexity around condition, ownerships, covenants, and investment that will require a strong leadership, vision and innovation. The starting point should be to look beyond traditional retailing. While shopping centres cannot compete with the convenience of online or out-of-town retail parks, they can start to develop high-value experiential propositions and mixed use communities. The key to creating communities is to engage and understand them and then to develop a complex matrix of emotional, physical, sensory and digital ties that allow targeted and multichannel selling of goods, services and experiences. And partnerships – could the shopping centre incorporate some housing into its superfluous retail space, creating footfall, passive surveillance, community and consumption? What about libraries, galleries, art centres, health centres, nurseries, crèche facilities, playzones, business incubators, hatcheries and co-working space and gyms? Bring in farmers’ markets, events and activities, better food and drink offerings, concerts, boutique cinema and performance. Develop intuitive and value-focused experiences that your demographic will relate to. If the centre serves a predominantly ageing demographic then wrap the core retail with health, travel, care, activities, finance, insurance, exercise and advisory services. Deploy digital technology to create seamless links between online and onsite and create showrooms and concession spaces where online sellers can promote their leading lines in a physical environment. Motherwell is an example where the owners have developed a compelling product. They recognised that local identity runs deep and analysed the demographic, looked at spend and behaviour and developed a product mix that has seen vacancies slashed and footfall increased. New tenants such as Costa, Pure Gym and Warren James were secured and a range of community events and festivals developed. Better partnerships were created with stakeholders, transport providers and the council to improve civic realm, digital investment, cross-marketing and a much cleaner, greener and attractive family-friendly environment. Time to think outside of that big box to see what small boxes go back inside. Retail and the Future of Towns: The Ghost of Christmas Yet to Come? STP Chief Officer Phil Prentice argues that retail trends in recent decades are not the sole cause of problems facing town centres – and that getting the right retail offer is only part of the solution for the future of our towns. Portents of doom, the death of the high street and the end of retail? Retail has always been one of our most fascinating and fast paced industries, it isn’t the cause of the problems faced by the high street, and importantly it is only part of the solution. Retail is a shape shifter, it reinvents and repurposes in a never ending cycle to meet the current needs of its customers. When Charles Dickens penned “A Christmas Carol” in 1843, his high street would have been an eclectic mix of fresh food markets, taverns, small scale tailors and tearooms, the butchers, bakers and candlestick makers. The early 20th Century saw the birth of the department store, the 1930’s saw the explosion of grocery chains and these were surpassed by the superstores, malls and destination retail that we know today. 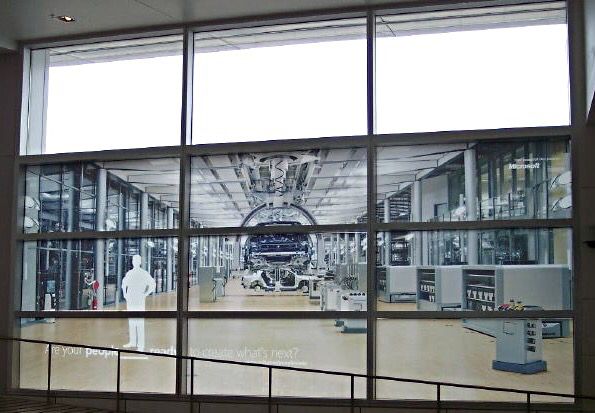 With wider societal changes bringing more home ownership, the motorcar, deindustrialisation, urbanisation, retail has delivered; with DIY hyperstores, industrial scale garden centres, car parts warehouses and grocery stores larger than football stadiums. Over the last 20 years we have witnessed transformational change on our high streets in particular. 1995 saw the launch of Amazon as an online book retailer and in the same year eBay created the online auction platform. The growth of online retail since then has been rapid. Cheap imports, online platform developers, fulfilment and logistics have been the winners in all of that. The internet along with poorly connected edge of town retail parks are often held up to be the main contributors to the decline of the high streets and town centres. However, this is a blunt acceptance which tends to mask broader issues such as the attractiveness of the town, the retail mix, the size and range of stores, the degree of convenience and accessibility for multi modal access, opening hours, cleanliness and the perception of safety, location of footfall creating uses such as leisure, public services, food and drink, transport, health, libraries and museums. The internet will continue to be the main shape shifter for the decade ahead of us. But also consider the impact of the financial crisis of 2008 – the stalwarts of a generation disappeared in a matter of a few years; Woolworths, Comet, JJB Sports, Game, Clintons Cards, Peacocks and BHS. Investors nervous, money tight. Meanwhile, Westminster policy around austerity in effect took 25% of all disposal income out of shop tills through public sector job cuts and welfare reform, the VAT hike to 20%, more recent increases to minimum wage, rates revaluation, pension auto enrolment, it goes on. This all leads me back to my initial point: retail is not the problem and that it is only part of the solution. If we take it for granted that our once handsome and characterful town centres are still of value to society, that the history, heritage and culture of the built environment is too important to lose, then have a think about how we can collectively improve them. There will be some set ingredients and some which are more random, however, the final product needs to deliver on a proposition demanded by the population it serves. We will almost always require some form of convenience retail, the local grocer. Then there are retail services, the hairdresser, beautician, food and drink, clothing, travel agent, optician, lawyers and accountants. The last 3 years has seen a drop in the vacancy levels in Scotland’s town centres, aggressive discounters, café culture, and the return of family run niche independents. If we add in some footfall creating uses and tighten up on poorly connected out of town sprawl, then we have a strong chance of reinvention. Lose the redundant peripheral retail space and replace it with housing and leisure uses, bring new communities and consumers back into town. Concentrate your public services in the centre, deploy digital investment, encourage more community participation, be flexible around planning and collaborate. The complex and busy lives we lead demand convenience, so where would we be without the local grocer? That original town centre anchor and stalwart; the local shop which opens early and closes late, where the provision of essentials blends into a familiar face and a sense of community. All on your doorstep and very often the only show in town. 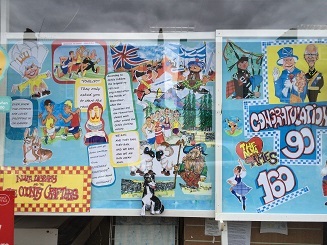 Despite the changing face of retail; with the proliferation of edge and out of town retail parks, destination shops and online platforms, Scotland still has over 5,300 convenience stores, ranging from cooperatives, franchises and symbol brand stores to multiples and independents. Collectively they contribute over £530m to the Scottish economy and they support over 40,000 jobs. Take Gourock, a typical Scottish town with a population of 11,000. Gourock is in Inverclyde, “doon the water” - where the Firth opens up towards the Irish sea. Its development has reflected its location on the River Clyde. Historically activities such as rope making and fish processing took place. Clyde steamers stopped at Gourock (where passengers could transfer to the train) and today it is the headquarters of Caledonian MacBrayne as well as being the main ferry port for Dunoon. Other activities have included warehousing (Amazon) and electronics. Gourock is very mixed in terms of population age and wealth, and for two successive years it has been voted in the Local Data Company’s top ten for having the highest levels of niche independent retail. In the town itself there are also a healthy number of convenience stores and this mix helps to keep the town lively and engaging. Indeed, Gourock has recently benefited from a Council-led £6m roads and infrastructure investment as well as significant upgrades to the rail hub, ferry terminal and car parking. Retail is a very important sector to the wider Scottish economy – there are more than 20,000 businesses, 250,000 jobs and it’s a £7bn market. 2016 was an interesting year to say the least. 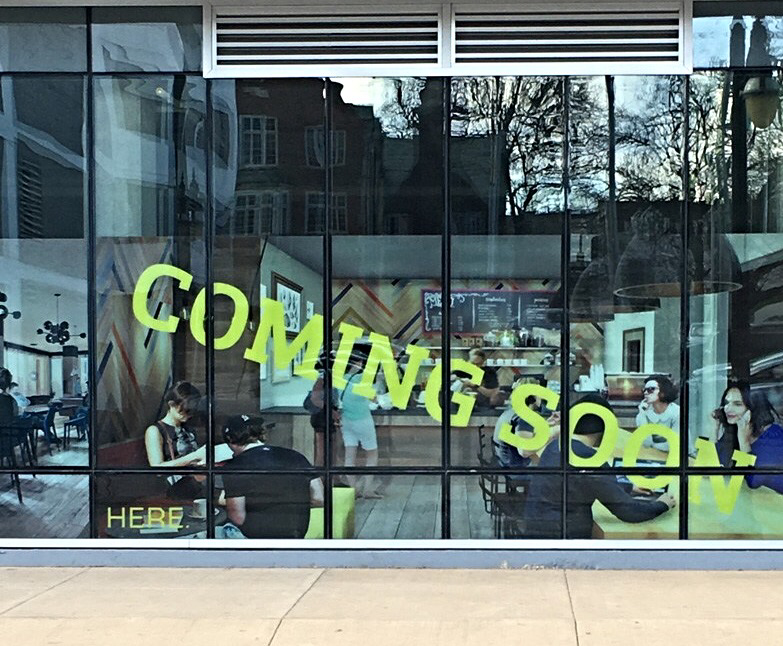 With all of the noise and turmoil it’s only understandable that some things will have slipped under the radar; one of these has been the story of signs of green shoots in our town centres and in evolving retailing trends. The 4th LDC and Institute for Retail Studies (University of Stirling) Scottish Retail Report (2017) delivered a number of interesting and positive trends. Then there was the growth of independents: new retailers coming back to the high street which was encouraging in terms of seeing confidence returning to places which aim to be unique and different and try to reflect the needs and aspirations of their customers - places like Gourock and Kilmalcolm in Inverclyde to Kirkcudbright and Moffat in the South of Scotland. And more growth can be attributed to the new aggressive discounters – the pound stores, the bigger retailers developing smaller footprints and formats for convenience stores, the rise in vap shops, craft and creative and the explosion in café culture. It's great to see so much improvement and positivity, and working quietly in the background, open all hours and serving the local community, you’ll find the local Grocer. And for once I’m not talking Whisky or Harris Gin. Alongside the likes of Uganda, Bolivia and India, Scotland is included in the prestigious Rough Guides top 10 countries to visit in 2017. Global visitors are told to expect whisky, wildlife, a warm welcome and the opportunity to experience the most recent addition to the nation’s tourism offer – The North Coast 500. Cast your minds back to Scotland 2014, seems like an age away now – The Bannockburn Homecoming, Glasgow’s Commonwealth Games, the Ryder Cup and then the Independence Referendum. For a year Scotland was the noisiest and most electric nation on the planet and I think we can start to get some of that Spirit back in 2017. Our towns and cities need to be geared up to welcome more visitors and to collaborate together to create authentic journeys and experiences that will help drive economic success. We should take great pride in the fact we have some of the best scenery, destinations, towns and cities, heritage, culture and food and drink in the world. Too often we take all this for granted. Look at what Paisley, Perth, Aberdeen and Dundee are all working on in terms of Culture Bids – all of this will add new colour and spark to already exciting places. Glasgow and Edinburgh can already compete with any global city destination – for culture, connectivity, creativity, heritage and hospitality. The Spirt of Scotland campaign is still running globally and businesses, destinations and events can all still tap into this platform - Spirit. Visit Scotland also has its free web listing - Visit - and last year more than 20 million visitors used this website to find out about accommodation, food and drink, activities, festivals and events. It’s a fantastic and cost effective way to promote your towns and businesses, both nationally and globally. The opportunities to engage with this theme year are significant, given that Scotland more or less invented the modern world. From Britain’s first Capital City up in Orkney to the string of castles, monuments and ancient battlefields in the Scottish Borders, Scotland has a depth of assets and a story to tell that makes us the envy of the world. So let’s engage, and showcase the best of Scotland to locals and international visitors alike, the towns and cities that drove international inventions and created our industrial revolution. Come to Greenock to learn about James Watt and the steam engine, or to Paisley to learn about weaving, textiles and sanitation, Dundee for jute, jam and journalism. Helensburgh can curate John Logie Baird’s television, Edinburgh can tell you about Alexander Graham Bell’s telephone, and Ayrshire on Alexander Fleming and penicillin. Kirkcaldy is home to Adam Smith the father of modern economics, Dunfermline was the birthplace of the industrialist and philanthropist Andrew Carnegie. We can tell the world of the story of the Enlightenment and showcase some of the best educational facilities and universities in the world. We can also show how social pioneers like Robert Owen (Welsh social reformer) developed systems of fairness that the world is crying out for today. The outstanding world Heritage site in New Lanark is a testament to social progress. It’s also the Chinese Year of the Rooster – Romance, Luck and Personality. We have Romance and Personality in abundance and we can make our own luck this year. Let's get back into the Spirit, and aye, have a whisky or gin as the year unfolds. Sometimes less is more. Change comes at a pace and panic sets it. Three or four shop closures on the high street becomes a crisis and before you blink the whole character of the street is lost. But maybe the closures were not such a bad thing. Perhaps the uses were no longer relevant and tired. Perhaps the street itself remains characterful, it just needs a nudge in the right direction. So a strategy evolves – this street can become the funky, eat, drink, meet and socialise place in town. It’s a lot easier to fix something when you know what the end result looks like. Start talking to your business community, look at how other places have tackled this, who are the new boys in town? Tidy the place up, build on the existing character, invest in some lighting and street furniture, green it up and make it feel loved. If you had the choice to invest in Sid Cars or the units below, which would you choose? Tackling shop fronts or encouraging the owners/sellers/agents to use 3D visuals is a great way to sell a proposition and set the vision for that part of town. These are quick and easy fixes but in my opinion, where they are linked to a joined up strategy, the impact can be substantial and investment can be stimulated. And what cost? The cost of despair and decline is difficult to measure. The cost of doing a bit of well planned window dressing will be a lot less than you think. Check out the latest member to join STP - http://specializedsigns.co.uk. 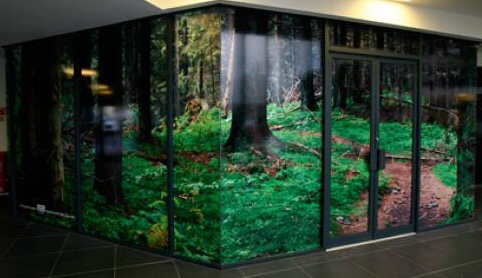 Get inspired by Cowdenbeath's fantastic initiative to be creative with unit shutters in the evening. And most of these miles have been on the railway - it's a fascinating way to travel, particularly outside of the peak times. You relax in comfort from the elements, enjoy wi-if connectivity to ensure you can still be productive, and soak in some of the best scenery in the world on the way to some of the best towns in the world. It’s just as well I enjoy it as I spend on average 4 hours training it every day. A modern day tartan Kerouac of trains ! Whatever your stance on railways and trains, privatised or nationalised, underinvested, good or bad, the truth is (IMHO) that the current franchise operator, (Abellio) has been a breath of fresh air. Trains are being modernised and electrified, stations are being built and upgraded, new lines and destinations are being created. The real difference though is in how the train is being viewed as a national economic asset – moving goods, people, data – linking people to jobs, driving economic prosperity through tourism. And doing it sustainably. Just look at what the new Borders railways has delivered to Galashiels and the South of Scotland. The doorstep to destination concept, fixing the link (between the station and the town), making the station nicer – the research shows that this makes folk stay longer, spend more and return again! Whilst the early railway was primarily built to support industry, nowadays the rail plays a critical role in connecting people. Primarily Ayrshire and Inverclyde to Glasgow, the Lothians and Fife to Edinburgh. And then the long haul routes – connecting the central belt to Inverness, Aberdeen and the Highlands. The importance of the railway is significant, and in hindsight we would have resisted many of the Beeching cuts from the 60’s and 70’s. We need a period of intense modernisation and investment and perhaps – more trams and city and regional growth infrastructure investment. Ultimately we may bring the ownership back into public hands, meantime I’m happy clocking up the miles. In the early days of the Industrial Revolution, several mill towns including Tillicoultry, Alva and Menstrie (the hill foot Villages) grew up in the shadow of the Ochil Hills. To the north of the Forth Valley, this undulating plateau was without a prominent peak and the small towns were able to tap into the water power from the south flowing burns which cut deep ravines into the hillside. Some of the mills are open today as museums, a reminder of this industrial age. So what next for these hidden gems. The starting point is to understand these places; what role they perform now, who lives there, what are the big issues? The evidence toolkit developed by Scotland’s Towns Partnership, Carnegie UK Trust, Centre for Local Economic Strategies and Stirling University - Understanding Scottish Places www.usp.scot is a great way to begin to analyse the facts. All three (in particular Menstrie) are relatively speaking well to do and they have many similar characteristics. They are predominantly suburban, commuter locations, they have slightly older populations and these populations tend to be well educated and better off. Both Tillicoultry and Menstrie are classed as interdependent to dependent whilst Alva is classed as an interdependent town. All have a good mix of quality independent retailers, small multiples, local service businesses and amenity. For the record, an independent town will have a high number of public; commercial; and social economy assets in relation to its population. This will include GP surgeries and charities. It will have a diverse sector base in terms of jobs. Residents will travel short distances to work and study and the town will attract people from neighbouring towns to access its assets. A dependent town will have a low number of public; commercial; and social economy assets in relation to its population. It will be reliant on singular sectors in terms of jobs. Residents will travel longer distances to work and study and the town will be reliant on neighbouring towns for assets and jobs. An interdependent town will sit somewhere between independent and dependent towns. For some public, commercial and social economy assets it may have a high number in relation to its population and for others a low number. A balance of people will work and study in the town with others reliant on neighbouring towns. Like so many places in Scotland, the main asset cannot be taken away, these towns are dotted along the foothills of the outstanding Ochil Hills. Apart from the incredible natural environment, there is also very high quality greenspace within the towns themselves. All the towns are connected to a superb national cycle network, Route 768, which also includes former strips of railway and is family and pedestrian friendly too. So walking, cycling and developing the great outdoors would be one way to build success. 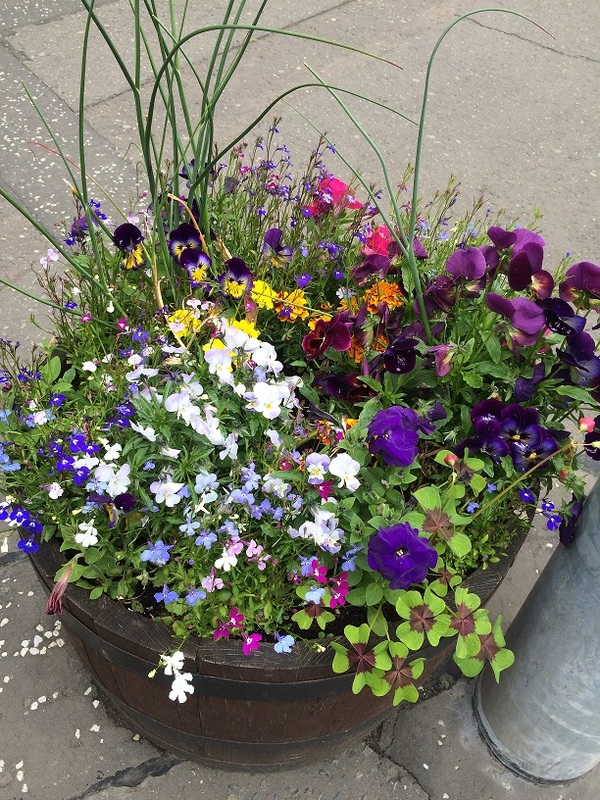 Taking care of the basics in the towns themselves – flowers, planters, trees and hanging baskets, brightly painted shopfronts, providing services for the hill walkers, cyclists and families. Differentiate – offer something new – family fun days up Alva Glen, more activities in Woodland, Johnstone and Cochrane Parks. This would be a great place to test the 4 Pillars of the newly evolved blueprint – the World Towns Framework – (i) Unique Sense of Identity and Place; (ii) Local Economy; (iii) Environment and (iv) Governance and Citizenship. If local residents, businesses and leaders recognise the potential and work collaboratively to deliver, then the hidden gems could become even better places to live and to visit. 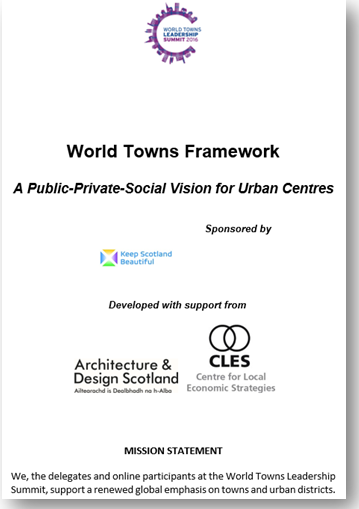 Last week saw Scotland play host to a unique gathering; the first ever World Towns Leadership Summit brought together 200 leading urbanists, planners, economists and practitioners from across the globe to discuss how to make our towns and city districts fit for purpose in a fast moving 21st century. From Tranent to Times Square we had leaders from numerous Towns and Cities including representatives from the US, Canada, Denmark, Sweden, Kenya, South Africa, Europe and the rest of the UK. Developed in partnership by the International Downtown Association, the Association of Town and City Management, Business Improvement Districts Scotland and Scotland’s Towns Partnership, the event pulled together a new international community of best practice from the public, private, third and academic sectors. And despite the challenge of having very different political, economic and social systems, we discovered very quickly that we all faced common problems. Over the course of two intense days in Our Dynamic Earth, Edinburgh, these thinkers came up with a new global approach to improving towns, neighbourhoods and city districts; The World Towns Framework – built around the four pillars of Unique Identity and sense of place, economy, environment and leadership. The World came to Scotland, not just to see what we are doing to support towns, but to hear how places like Grand Rapids, Mobile, Times Square, Charlotte, London and Yonge (Ontario), Copenhagen, Belfast, Dublin, Wrexham and many others were dealing with the pressures faced by our towns and city districts. The continued drift of talent and youth to city economies, wider structural changes to political and economic systems, hollowing out, loss of identity, changes in retail behaviours where we use tablets, online, click and collect, out of town and destination shops, the ongoing impact of the economic recession, dysfunctional property and housing markets, welfare reform, less disposable local income and a fast shrinking public-state sector. The positive energy and new thinking that emerged in Edinburgh was inspirational, however the biggest gain from a personal perspective was the new friendships, relationships and connections - both professional and personal, that developed over the course of the Summit. We have created a virtual learning network which spans the globe, we will be able to share new ideas and approaches much more effectively and drive change through innovation and passion. The world we live in often feels chaotic, individuals display a growing disaffection with society, we appear desensitised to conflict and corruption. A lack of control and influence in a superficial world that crowns reality tv kings and then switches to children drowning in the Mediterranean without a second thought. We learn that 1% of the worlds population owns more than 50% of it’s wealth, that our children will be worse off than us, that we are currently consuming at a rate of 3.4 planet earth’s - last time I looked there was still only the one. 1: The unique identity of place - support the unique characteristics of each town and urban neighbourhood, the ‘DNA of place’, to engage communities, businesses and institutions in driving forward their future, and address the plural and distinctive set of challenges facing towns. Develop unique visions, encourage plurality and participation, acknowledge there will be multiple pathways. 2: Local economies - We recognise that the scale of small towns and urban neighbourhoods facilitates people meeting each other, sharing information, opportunities and insights. Driving effective change needs rich local data – conversational, experiential, quantitative – and local ways to harvest that data. That should lead to open sharing of data and knowledge. Differentiate and create comparative advantage and smart specialisations. Foster local Leadership, mix up traditional top down initiative, alongside new spaces for co-creation, and co-production. We recognise that great towns have great economic relationships. These relationships foster collaboration, based on shared outcomes. We recognise that successful places will embrace the blurring, bridging and fusion of the traditional boundaries between public, commercial, and community sectors. We can have Hubs to integrate new cultures and citizens, alongside modern governance structures with inclusive, transparent and open structures that engage citizens and direct the future of towns and urban neighbourhoods. These are big thoughts for a big issue. Join us at the World Towns Leadership Summit in Our Dynamic Earth in June to see how we can start building a better world. My Belfast of the future is already taking steps towards healing the wounds and rebuilding, there is hope in bomb city. Scotland’s Towns Partnership attended the Annual Local Environmental Conference hosted by Keep Scotland Beautiful, which is the charity that campaigns, acts and educates on a range of local, national and global environmental issues to change behaviour and improve the quality of people’s lives and the places they care for. They are making good progress but face a difficult struggle. The conference brought together some of the latest thinking to explore how to make Scotland cleaner and tidier, and importantly that this responsibility belongs to all of us. 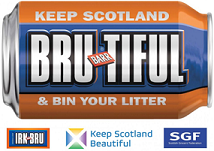 AG Barr, the manufacturers of Scotland’s national tipple, no that’s not whisky, it’s Irn Bru; talked about the increase in corporate social responsibility to support communities to clean up, but more strategically how they can reduce waste during production, logistics and packaging. Scotland has some of the world’s most outstanding natural and built environments, so why don’t we take more care of these assets?Our very own Professor Leigh Sparks, Chair, STP, discussed the important links between people, place and the environment and amongst a host of speakers, we also heard from the NHS and the Forge on the importance of this agenda. Our streetscapes our home to our heritage and culture as well as the civic spaces where we want to meet and socialise. Why would we drop litter, cigarettes, and general debris on the ground when there is a bin 10 yards away? Says a lot about the individual. The biggest complaint most folk have about their town centre is that "it's dirty". All too often the state of a town centre reflects the health and well being of its surrounding population, as well as its ambition, vibrancy and prospect as a place. Scotland's Towns Partnership recognises the value of good local environmental quality standards. Just get the basics right, the rest will follow. A clean town is a healthy town, a place to be proud of and a place to grow - local government and its partners must see this as one of their most effective preventative investments. We all have a duty to care for the places we call home. It will take educational step change to address and worsening picture. Scotland’s Towns Partnership and EKOS have spent an extremely enjoyable two days in Stornoway undertaking a full town audit and producing a town centre strategy for Comhairle nan Eilean Siar. Originally founded by Vikings and famed for it’s Black Pudding, the town lies in a sheltered natural harbour which today acts as a maritime port, small shipyard, fishing port and more recently as a leisure marina. Aside from the outstanding natural beauty and rich built environment, the people and culture set this place apart as somewhere special. 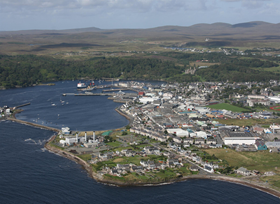 Stornoway town proper has a population of around 6,000 with an immediate catchment of 9,000. It is the gateway to the Outer Hebridies and acts as the regional service centre for Lewis and Harris. Connected via Ullapool via daily modern Calmac ferries, it also has regular flights to and from Glasgow and Inverness, in addition, Stornoway is about to benefit from the national roll out of superfast broadband which will reduce the perception of peripherality even further. However, like all advanced economies, Stornoway is experiencing issues such as ageing population, depopulation and drift to urban centres, retail and public services are under pressure and there is the usual lack of focus and sense of leadership in the town centre…hence our visit. Over the course of our work, the level of engagement and recognition that the town is pressured has been inspirational - we have had input from the Council, Highlands and Islands Enterprise, University, Stornoway Regeneration Group, Stornoway Amenity Trust, the Development Group, Historical Society, Lews Castle, Port Authority, An Lanntair Creative Hub and business groups. It comes as no surprise that Stornoway’s Business Confidence rating is the highest we have found to date at 80%. Stornoway has strong collaborations and partnerships at all levels and this is their key strength; as a small community they are knitted together as tightly as the island’s tweed. The town itself has some great assets but they need to work harder. Lews Castle, An Lanntair and the high prevalence of niche high quality independent retailers all create a strong pull. There are good points and bad but by and large given its monopolistic position, it has an inherent inbuilt resilience and many of the necessary improvements in the future will be cosmetic rather than structural. Stornoway and the wider Islands offer a lifestyle proposition which blends modern living with an Island idyll, it’s a bucket list destination that everyone should take time to visit…and perhaps you’ll even be tempted to stay, it’s closer than you think. “Britain is a nation of shopkeepers” is a phrase commonly attributed to Napoleon and while many years have since passed, the importance of SME’s to the Scottish economy cannot be understated. As of March 2015, Scotland had over 360,000 SME’s accounting for 99.4% of all private sector employment. Almost 2/3rds of these businesses and jobs are located in Scotland’s towns. Many of our towns initially grew as hubs for markets, trade and as commercial centres. Towns are the natural place to do business, they have scale and density, they are where paths, rivers, roads and railways connect and they offer the community and social interaction demanded by business transactions. We are witnessing major changes in the structure of our economy, retail is changing, the public sector, traditional industries, engineering and manufacturing are shrinking. There is a rise in the service sector alongside low pay, insecure employment and zero hour contracts. We risk becoming the sweatshop of Europe. Then there is the way we work, we’ve seen strong growth of coworking, flexible and agile jobs, multi jobbing, lifestyle self employment, consultancy work. Are these the future norms? The endless interventions by the state to increase start-ups, innovation, entrepreneurship and invention have with the exception of a few, failed miserably. Why? and why have we gone from being the leading inventors and engineers in the world to an economy hampered by low productivity and an over-reliance on a bloated and unsustainable public sector? We are now players in a digital global economy, so where can we achieve a step change? Where we have seen success at the margins is where a knowledgeable private sector collides with passion and philanthropy; and the public sector embraces, facilitates and supports this. The eSpark model of accelerators, hatcheries, incubation and pitching brings the best of current international business practice into a highly competitive process to ensure fledgling businesses have the necessary tools, support and investment in this new economy. The Melting Pot in Edinburgh houses more than 160 social enterprises in less than 1,000 sq ft, the flexibility of pay as you go, rent a desk or hire a room is attractive to this new worker /coworker / business. The Falkirk Business Hub is a fantastic example of how a traditional business centre has been creatively reengineered to provide a modern café, health and well-being centre, flexible small business space, coworking zone and a wide range of support and mentoring services. In each case a philanthropic and knowledgeable entrepreneur(s) has focussed on a high quality and relevant vision, built a community, engaged, inspired and grown the community – all with some appropriate and well planned public interventions. For those of you thinking about embarking on this journey, beware, there are many imposters… speak to Jim Duffy at eSpark, Claire Carpenter at the Melting Pot or Alistair Campbell at the Falkirk Business Hub to see how this is done properly. They all offer a very different product, and they all target a specific market but these are products and markets which are becoming more and more relevant. Out with the old and in with the new, 2016 will no doubt continue to produce its challenges for towns but at the same we feel that this should be viewed as a year of opportunity. The economy is still relatively stable and slow but solid growth, alongside reduced fuel costs and modest wage increases may see confidence rise and produce a much needed boost for our town centres. There seems to be a growing acceptance that change is happening fast and that we must work more collaboratively to ensure that our towns remain vital and vibrant. This means basing investment decisions on evidence, understanding what our key assets are, embracing the town centre first principle and looking at the widest possible partnerships to see how tourism, digital, public services, retail, commercial, health and greenspace, housing, leisure, transport, museums and attractions, events and marketing can all help build better places. Success will come from better public-private-third sector working and more joined up community planning partnership decision making. Scotland’s Most Improved Town competition ran in conjunction with SURF last year proved that places like Barrhead, Kelso, Kilmarnock and Irvine all have great potential and can be greatly improved with the right approach. The Sunday Herald media series on Scotland’s Towns also highlighted the sheer depth and richness of our towns as well as their economic contribution and critical importance in relation to our well being, our heritage, culture and tourism industries. 2016 looks like being an extremely busy and productive year for Scotland’s Towns Partnership. We will continue to run our regular training events and conferences, improve our web and toolkits and help develop and promote new supports including a strategy and resources for digital town centres. 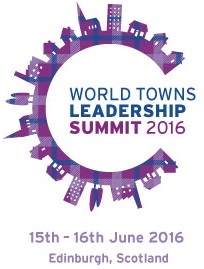 We have also secured the first ever World Towns Leadership summit which will be held in Our Dynamic Earth on the 15th and 16th June. This will provide us with an international platform to learn from the experiences of towns from across the world and to showcase the best of Scotland’s Towns. We at STP will keep the spotlight on towns, 2016 can be a year where our communities and local leaders take ownership and drive improvement. USP is the first tool of this type in the UK and has generated significant interest from Government bodies in Wales, England and Ireland who have all recognised the value in having such a comprehensive data platform. It is a platform measuring every town in the country with a population of 1,000 or more, and provides us with the first ever typology for Scotland's towns. Uniquely, it can show how dependent or independent each town is against a carefully agreed scale of measures. This provides practitioners, businesses and investors with a fantastic starting point to see how to improve things and perhaps to see where others within the same towns typology are doing slightly better. It is critical that all towns and town centre improvement activity such as a BID, starts off with a solid evidence base, ultimately this will enable stronger decision making but importantly it will also provide a means to measure success and progress (or indeed the lack of it). Once you have established your USP typology, the next step is to build a more detailed picture and this is where the Your Town Audit comes in. This is our attempt to standardise the way we measure the health of Scotland's towns. 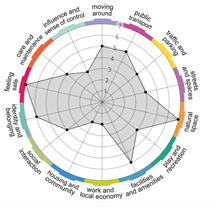 Scotland's Towns Partnership can also deliver a fuller version of Your Town Audit which covers the 7 KPI Themes above but looks at gathering 250 relevant indicators to build an excellent baseline for your town. This takes 12 days and there is a one off cost attached, but we will train your staff, (whether that is Council, Town Centre Partnership or BID staff) so that they can do this for themselves in future. More BIDs and Councils are adapting this approach so have a look below and come and talk to us. It was great to see 21 town centres across Scotland being awarded funding from the £1.7m Town Centre Community Capital Fund. I sat on the awards panel and was even more encouraged to see the sheer range and scale of applications; from town centre wi-fi, to redevelopment of derelict buildings and the creation of community enterprise space. A lot of inspired and innovative ideas to breathe new life back into our town centres. Almost 180 projects applied for support and whilst the judging was extremely difficult, those awarded funding tended to have strong structures and governance, ie a BID or a Development Trust in place to lead with the management and delivery of the project. As funding becomes even tighter over the coming years it's imperative that local groups consider the widest range of options to maximise their chances of achieving external funding. Your governance structure will depend a lot on what you are ultimately trying to achieve and the scale of your organisation. From my own experience, a Business Improvement District with a charitable arm offers a solid platform for local businesses to engage collectively and sustainably, it creates a pot of funding that can be used as match and gives a reasonable timeline for delivery. The BID also provides flexibility and most importantly, a resource to enable things to happen. Start thinking about the assets you have that could attract external funding support; historic, cultural, creative, digital, health, greenspace, space for community and enterprise, events and markets, marketing and loyalty schemes, paths and cycle paths, bus and train stations. Think how these assets could work harder for your town, would a more attractive train station encourage more people to visit? To stay longer and spend more? Would cycle racks and improved signposting encourage new customers into town? Think about evolving markets and link these to what you already have. Now that Black Friday and Cyber Monday are out of the way, keep an eye out over the coming weeks to see how many of Scotland’s BIDS take the lead to support local businesses and communities in the run up to Christmas, through marketing, events, and Christmas choirs and lighting festivals. http://www.bids-scotland.com/ This is community empowerment and localism at its best. Next week on Wednesday 18th November, Falkirk plays host to the most important date in the calendar for Scotland's Towns. This year’s Annual Conference will focus on "Transforming Scotland's Towns". Over 200 leading towns practitioners from all sectors will gather to hear an exciting range of speakers, including Marco Biagi, Minister for Local Government and Community Empowerment, Ross Martin of SCDI and an international perspective from German urbanist, Cord Soehlke. Get local and national perspective, find out what the ideal future town looks like and fresh from the fringe hear from "Keep out the Kids"
Scotland's towns continue to define the character of much of the country, they also help to define their home city, shaping their regional hinterland with individual and collective character. In most cases they are so much more than the "dormitory" towns of popular parlance. The relationship between Scotland's towns and our seven cities is a crucial part of our economy, let alone wider society, with each feeding off the other, their interdependence often missing from the public policy debate. Find out more about what is being done to bring vibrancy back into our towns at Scotland’s Towns Conference 2015. We all used to live in town centres, why can't we live there again? Being limited or locked out of suitable housing options is probably the single biggest social injustice faced by those under 35 years of age today, with private renting becoming the norm and average rents now more expensive than a mortgage. The typical age of the first time buyer in the UK is now 36, the spare bedroom to enable saving and then the bank of mum and dad is almost always required for the deposit, banks are reluctant to lend post financial crisis and whilst low mortgages are keeping the wider economy on life support, for young people on low incomes and in insecure employment it's almost impossible to find one. Mortgage approvals are picking up slowly from the lows of 2009-2014, mainly because of low rates, but house building is still sluggish with a shortfall of 14,000 per annum compounding the problem and driving more young people towards the private sector housing market. Even with the highly commendable approach from the Scottish Government who are committed to spending £1.7bn to build an extra 30,000 affordable homes, of which 2/3rds are to be social and 5,000 new Council stock, this still leaves us with 150,000 Scots trying to get into social housing, a similar number acknowledging they have no other option but to struggle on in private rented accommodation and the same number again seeking their first step on to the property ladder. That's almost 20% of the current working age population, although in reality this figure will be much higher given those over 35 will most likely already have a home..We are all aware of how critical a well functioning housing market is to the economy, it encourages social mobility and allows for upsizing and downsizing as well as supporting jobs in planning, finance, construction, banking and legal sectors. So is there a ready made solution…. At the same time our town centres are facing the perfect storm, many are at a crossroads with the continued drift of talent and youth to city economies, structural changes in retail where we use tablets, online, click and collect, out of town and destination shops, the ongoing impact of the economic recession, dysfunctional property and housing markets, welfare reform, less disposable local income and a fast shrinking public sector. The issues are complex and there is no silver bullet solution but a good start might be to link these two problems together. Towns already have the required infrastructure and utilities. A lot of retail units will continue to close, the public sector estate will shrink and a lot of space above ground floor offices and shops retail is already currently fallow. There is a lot of space to play with in all of that. So with the Community Empowerment Act now in place and Public Sector pension funds seeking an ethical home, why can't local communities start looking at delivering housing solutions back in their town centres. This approach delivers on low carbon and on social justice, it creates appropriate local housing options as well as delivering on social and economic outcomes…and it puts vibrancy, security and footfall back into our town centres. Ayrshire is synonymous with Burns, golf and childhood memories of trips “doon the water”. 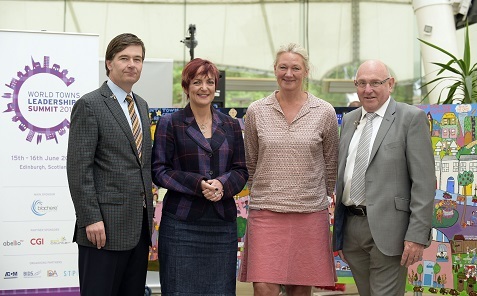 I had the recent pleasure of meeting Fiona Nicholson and Sharon Hodgson (Kilmarnock – East Ayrshire), George Hunter (Irvine – North Ayrshire) and David Bell (Ayr – South Ayrshire). Collectively they all understand the challenges ahead for the Ayrshire towns as well as the significant economic, social and cultural role that these towns play in the wider region. Ayrshire has some great towns and is steeped in history and culture. I visited the three main towns of Kilmarnock, Ayr and Irvine and was encouraged to see a wide range of positive activity to build on existing assists, involve communities and improve infrastructure. There is a collaborative spirit in the air (excuse the pun) as all three local authorities are now discussing the possibility of an Ayrshire wide City Deal. Beyond the main towns I was also able to see a wide range of smaller towns that form part of that historic Ayrshire tapestry, vibrant little gems like Stewarton, Prestwick, Troon, Largs and West Kilbride. The more peripheral former industrial towns such as Cumnock, Mauchline and Auchinleck had strong community projects and plans for improvement too. Ochiltree and the Princes Trust are making advances and community led developments across the Garnock Valley towns of Kilbirnie, Beith and Dalry were heartening to see. Kilwinning and Irvine provided some of the best examples of town centre public realm investment that I have seen in recent years. It was clearly evident that many of the Ayrshire towns are beginning to understand their evolving roleand function, not just in the immediate Ayrshire context, but in the Glasgow City region context. Many Ayrshire residents are using bus, rail and the M77 to access employment in Glasgow whilst retaining the quality of life benefits of a semi rural and coastal region. The big coast will require some big visions and much more of this collaboration, however as a package Ayrshire has something for everyone and remains one of Scotland's truly special places. Following the thought provoking launch by poet John Burnside on Scotland's Towns in May of this year, we are now halfway through the Sunday Herald series showcasing and celebrating Scotland's towns. The depth and richness of our towns has been matched by the quality of journalism and sheer enthusiasm from the team at the Sunday Herald as well as our local towns partners. The launch article by Burnside was an individual memory of the journey through post industrial Scotland and a vision of towns which offered hope in shared spaces in a sustainable, culturally rich and ecologically friendly way. We then moved to Ayr where we explored the notion of our how our 21st lives were changing the role and function of what were once our economic powerhouses. The lesson from Ayr is to look at a wonderful array of natural and built assets and to build upon these collaboratively. From Ayr we headed up the coast and inland Paisley to explore how the world renowned Paisley Pattern was being used as a springboard to reinvent a town based upon its culture and heritage. The feature provided us with insight as to how strong political leadership can help inspire a new culture of optimism and innovation. The next feature looked at the rich tapestry of towns across the Borders where the much vaunted Waverley Line opened on the 6th September. This showed us how trains, textiles and tourism were being used to revitalise the local towns and communities. Although we are only halfway through this wonderful series, the first thing that becomes apparent to the reader is how complex and interesting towns are. They hold our culture and heritage, they are home to almost 70% of our population and two thirds of our jobs and businesses, they have libraries, health centres, schools and colleges, museums, leisure centres, historic buildings, public services, green spaces and transport hubs. It's this complexity which makes the task of rebuilding a challenge for us all, but also points to the way forward for wider collaboration and partnership. Despite July being the wettest on record, I had the recent pleasure of touring the Aberdeenshire Towns with Audrey Michie, their lead towns executive. From Stonehaven to Ellon, Huntly, Inverurie and Turiff, Banff and Buchan to Peterhead and Fraserburgh, it was truly inspirational to see the wide variety of historic, market, coastal and commuter towns dotted across the massive expanse of beautiful and highly productive agricultural Aberdeenshire. The “Shire” has a unique symbiotic relationship feeding off the vibrant City of Aberdeen. The Council is one of the most forward thinking and developed in terms of the “Town Centre First Principle” in that it is taking a genuine cross departmental and wider community approach. All too often towns are left to Planning, Housing, Economic Development or Regeneration to “fix”. The Aberdeenshire approach is fresh and innovative in that everyone understands that the town centres are vital hubs and that they impact on health, culture, leisure, tourism and heritage. The recent investment of the Council hub into the heart of Peterhead not only brings valuable footfall and activity to the town, it is an inclusive approach, ensuring that all residents have access to vital public services. All too often the physical appearance of a town mirrors the health of its resident population. Town Centres in Aberdeenshire face many of the same challenges as small rural towns across the country; in addition to their peripherality, they too are suffering from the structural changes in retail, the dysfunctional nature of property markets post-recession, ongoing welfare reform and an ageing population. The growth of online home delivery of groceries is also having a major impact on these more rural towns. However, it was heartening to see a community starting to recognise the inherent value of their towns, economically, socially and culturally and to see the beginning of a well conceived approach to address these issues. I have to say that I found the quality and variety of these towns exceptional, a bit of a hidden gem to return to and the combined energy of the Council, the Community and the trusts coupled with Audrey’s determination left me in no doubt that these towns will thrive again. On the 6th September we will open the longest domestic rail infrastructure investment in the UK for over 100 years - the new Borders Railway. In addition to improving the sustainability of the Borders by opening up new commuting opportunities, it is destined to deliver substantial economic growth for the all of the Lothian and Borders towns. Nestled between the A1 and M74, the Scottish Borders region is often viewed as one of Scotland’s best kept secrets; it has an enthralling history, beautiful towns and abbeys and sweeping valleys shaped by the river Tweed and Teviot Hills. It’s also the international home to Rugby 7’s, the Scottish textiles industry and its rich agricultural lands produce some of Scotland’s best food and drink. I had the recent pleasure of meeting Douglas Scott who has long campaigned for improvements to small and rural towns across Scotland. I was taken from Galashiels through Melrose to Kelso and on to Hawick. We then visited Jedburgh, Selkirk and Peebles and passed through Newton St Boswells. It was clearly evident that many of the Border towns are already displaying resilient characteristics as they are the key economic and social hubs for the region and they understand that to improve this sustainability and competitiveness, that there is a need to improve these town centres to maximise economic growth from tourism, hospitality, food and drink, key sector growth, low carbon and renewables, private and social housing investment to attract new residents, to secure services for the existing population and to overcome peripherality issues through improved digital connectivity and the new rail link. Galashiels will benefit from becoming the new gateway to the Borders; it is already home to the Borders College and Heriot Watt campuses with a focus on textiles, an industry which many the Borders towns are synonymous with. Hawick, the largest town, still has a strong textiles base and a number of community led initiatives focusing on the town itself. Jedburgh and Kelso still act successfully as small market towns, Selkirk is developing a BID, Peebles has strong commuting links and good retail, sporting and cultural activities. It is heartening to see that so much is already happening and with the Council and the various partners committing to work with the Scottish Government and Scotland’s Towns Partnership to embrace the Town Centre Action Plan, we look forward to a wide range of new activities over the coming years geared towards breathing new life and investment into the Borders Towns. But maybe the closures were not such a bad thing. Perhaps the uses were no longer relevant and tired. Perhaps the street itself remains characterful, it just needs a nudge in the right direction. So a strategy evolves – this street can become the funky eat drink meet and socialise place in town. It’s a lot easier to fix something when you know what the end result looks like. Start talking to your business community, look at how other places have tackled this, who are the new boys in town. Tidy the place up..build on the existing character, invest in some lighting and street furniture, green it up and make it feel loved. If you had the choice to invest in Sid Cars or the units below, which would you choose ? Tackling shop fronts or encouraging the owners/sellers/agents use 3d visuals is a great way to sell a proposition and set the vision for that part of town. And what cost. The cost of despair and decline is difficult to measure. The cost of doing a bit of well planned window dressing will be a lot less than you think.